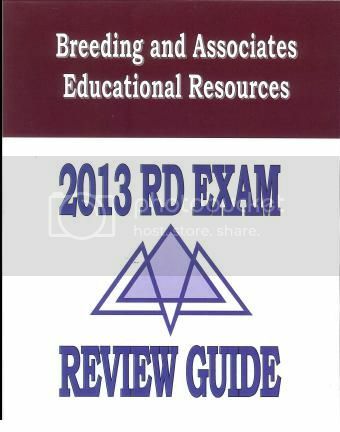 In the Breeding and Associates Registered Dietitian Exam Review Guide package you will find a variety of test prepreation and practice options. Below we have included some feature questions from the packet. To see the answer simply "mouse over" the area directly under the questions. Optionally you can make all answers visible by clicking here. If you would like to skip to a certain part of the page simply use the links below! What management function should require the greatest allotment of time by a production manager? A business pays 4% of its income for rent ($1200), 70% towards labor and food costs, and $2500 towards other expenses monthly. How much profit does this business make per month? Which oven is most efficient per cubic feet of space? A client comes to you on a low carbohydrate diet. She reports having one serving of carbohydrate per meal, 3-5 oz of meat each meal, no milk but eats cheese, and 2 vegetables. What nutrients will she most likely be lacking? What feeding method would you recommend for a patient who had previous good diet history who had undergone extensive bowel surgery and has an ileus and fever 8 days postoperatively? Which of the following nutrients contributes most significantly to the osmotic load of an enteral formula? Which of the following lipoproteins is considered most atherogenic in the absence of familial cholesterolemia? During exercise it is important to replace water which of the following who live in a warm climate would have the greatest concern? The patient has a severe acute pancreatitis with nausea and vomiting, and requires 2500 kcal per day. Which regime would the dietitian recommend? c. Directing or leading involves directing and channeling human effort for the accomplishment of objectives and Controlling comparing what should be done with what was done. Planning is done by upper management they set goals establish budget etc organizing develop objectives and plans to achieve them. Source: Spears, 2000. p. 83-90. Rent 1200 + food and labor 21000 + 2500 other expenses = 24700.
a. the convection oven cooks 1/3 to ¾ faster than the deck oven and it cooks at lower temperatures conserving energy. The microwave is for small amounts. The deck ovens stack, have separate thermostats and have 7-16” clearance. It would take several decks to replace one convection oven. Source: Spears, 2000. p. 426-427.
c. The major food source for folic acid, potassium, and vitamin A are fruits vegetables and legumes. Which are in very limited supply on a carbohydrate restricted Diet. d. The National Health and Nutrition examination Surveys provide information on health and nutrition over time. Reports provide a health profile for the community regarding prevalence of hypertension, cholesterol levels cardiovascular risk factors, obesity, iron status, etc. Source: Boyle and Morris, Second Edition, p. 121.
b. The feminization of poverty refers to the increasing number of children under six who live in families headed by a single female. (Almost 60%) Source: Krause’s 11th Edition p. 278.
d. Thiols are found in the cabbage family and onions. Source: Bennion and Scheule, 11th Edition, p. 289.
b. The smoke point temperature is above 442 degrees. Source: Bennion and Scheule, 11th Edition, p. 396.
a. Neutropenic diet should be low bacteria. The lowest bacteria choice is tang and graham crackers, .Foods to avoid raw fish, meats, mold containing unasturized cheeses, raw fruits and vegetables dried fruit raw or fresh roasted nuts, pastries that require refrigeration, dry/ fresh spices added after cooking, herbal supplements. Source: Krause, Food Nutrition and Diet Therapy, 11th Edition, p. 1016.
d. The post gastrectomy diet needs to consider iron, folic acid and B12 because B12 can not be absorbed without the intrinsic factor, which is synthesized in the stomach.. Source: Krause, Food Nutrition and Diet Therapy, 11 th Edition, p. 701.
c, The guidelines of the American Society for Parenteral and Enteral Nutrition patients who are well nourished prior to surgery should begin postoperative nutrition support after 7-14 days of little or no nutrition. TPN would be contraindicated in a patient with an elevated temperature. PPN is the best choice because it avoids using the GI tract. Source: Krause, Food Nutrition and Diet Therapy, 11th Edition, p. 534-537.
c. VLDL is made up of Triglycerides and their role in atherogenesis is uncertain. LDL are the primary transporters of cholesterol in the blood and elevation of LDL is associated with coronary risk. Source: Whitney and Cataldo 4th Edition p. 883.
d. Water loss depends on the intensity and duration of the exercise and on the temperature and humidity. Long strenuous exercise in a warm climate should replace water about every 15 minutes. Source: Krause, Food Nutrition and Diet Therapy, 11th Edition, p. 297-298.
c. Tube feeding is not feasible to the stomach due to nausea and vomiting. Feeding into the small bowel would not be recommended in a patient with severe pancreatitis. The closest to the calorie requirement is c. 2530 kcal. b. Synthesis of osteocalcin is dependant on an adequate supply of vitamin K.
Source: Mahan, 11th Edition, p. 642. Source: Mahan, 11th Edition, p. 363.
d. In the US the Food and Nutrition Board of the Institute of Medicine has led the development of nutrient recommendations since the 1940’s. Source: Mahan, 11th Edition, p. 364.
d. Calcium is the best absorbed in an acid medium, with a meal, which includes lactose. Oxalic acid forms an insoluble calcium oxalate in the digestive tract. Source: Mahan, 11th Edition, p. 123-124.
d. Coenzyme Q10 is a naturally occurring substance in the body that is an essential component of the mitochondrial electron transport system. Source: Mahan 11th Edition p. 75.